« Our poll-of-polls: Dead heat ! There was an election season DOJ action that’s partially responsible for the mess we have now. My conclusion in July was that Comey ruled illogically because he didn’t want to be responsible for tilting a potentially historic election. But, WikiLeaks revelations and an internal agents’ revolt left him no choice but to re-open the case. It was becoming clearer by the day that he (not the FBI agents!) blotched the case. Now, left-leaners are crying “foul” … asserting that the DOJ shouldn’t get involved in cases involving high profile candidates in the run-up to an election … especially if the charges are as “trivial” as carelessly handling our nation’s top secret information. Memo to Comey: It was DOJ action that changed the course of our nation in 2008 — giving us, for example, ObamaCare. Flashback to 2008 … you know, the year that Barack Obama was elected. Well, the DOJ didn’t indict Sen. John McCain for anything … or, overtly pave the way for Obama’s election …. but the DOJ did tilt the scales in a defining way. 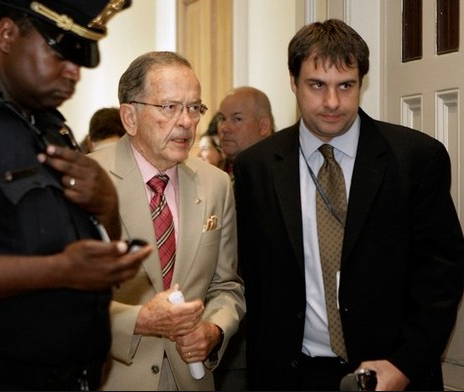 The DOJ indicted Alaska’s Ted Stevens, the longest-serving Republican senator in U.S. history. He was indicted during his 2008 re-election campaign. What were the charges, what were the implications, and how was the case ultimately resolved? The DOJ presented a Federal grand jury with charges accusing Stevens of concealing “lucrative gifts” on his financial disclosure statements, including a Viking gas grill, a tool cabinet and a wraparound deck. No security breaches, no evasion of the Freedom of Information Act, no links to his wife’s charitable foundation (since she didn’t have one). A Viking grill and a jacked-up house. Pretty garden-variety stuff in politics, right? Had Stevens retained his Senate seat, Obama wouldn’t have had a filibuster-proof Senate … and he wouldn’t have been able to ram ObamaCare through on a straight party line vote (coupled with later “reconciliation” shenanigans). And, some speculate, if Obama didn’t have the luxury of a super-majority, perhaps he would have tried harder to work on a bi-partisan basis, rather than just declare “I won” and start the divisive jamming process. Steven was convicted of failing to report improper gifts. Obama’s Attorney General Eric Holder (yes, you read that right) moved to have the verdict set aside in 2009 after finding widespread problems in the prosecutors’ handling of the case. The charges were brought by the Bush administration’s DOJ. The conviction was reversed by Holder … albeit, long-after the political damage was done. If the DOJ can tilt elections over gas grills and jacked-up houses … why not over violations to U.S. National Security laws? We can’t do that, right? Certainly, not so close to an election. This entry was posted on October 31, 2016 at 7:30 am and is filed under 2016 Presidential Election, DOJ - Dept of Justice, Stevens, Sen. Ted. You can follow any responses to this entry through the RSS 2.0 feed. You can leave a response, or trackback from your own site.